While Erin and I weren't scared, there were plenty of people who shuffle-stepped onto the walk and were grasping the steel hand-holds like their life depended on it. These people wouldn't stand on the empty glass, and wouldn't approach the edge, but stayed on the inside edge where they could see the steel support beams directly underneath. During our time on the bridge, though I watched one man do something remarkable. He made it out to the center of the walk, grasping the rails tightly and barely lifted his feet from the glass. I watched him take 3 breaths, close his eyes, release the death-grip but left his fingertips on the rails, turned toward the center of the bridge and took one giant step onto the empty glass. He stumbled when his foot hit the glass, but when he opened his eyes he was standing over empty space. He didn't jump back, he didn't scream; but what he did do was take a long look around, then looked down, then smiled. A genuine smile, like a weight was lifted from his shoulders. Seeing that experience is why I associate this quote with this picture. He got past his fear and had a potentially life changing experience. So, what are you afraid of? 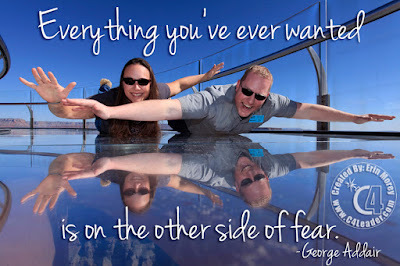 What risks are you afraid to take? Why? All the growth (and all the rewards) happens just outside the comfort zone. Perhaps you are ready to step out onto the bridge bravely, like Erin and I; or perhaps you are more like the man who took a giant step after shuffling across the expanse, but please please please don't be the person who sits at the edge of the bridge and wonders "what if." How will you build your bridge? 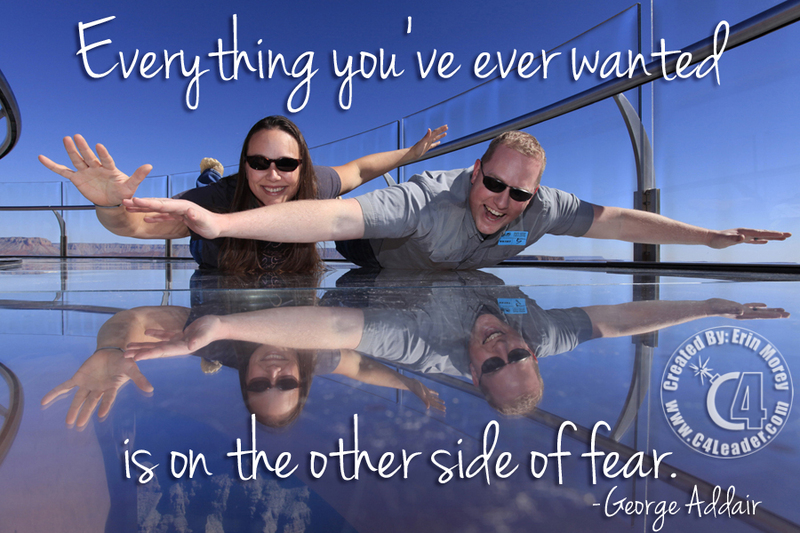 What fear will you overcome? Let's star this week!